Scientists has advised the UK government to halve the current recommended daily intake of sugar. Nutrition experts say no more than 5% of daily calories should come from added sugar – about seven teaspoons. Most people consume at least twice this limit. The government has said it will accept the recommendations and will use them to develop its national strategy on childhood obesity, which is due out later this year. 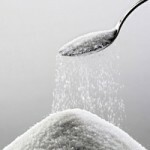 The Scientific Advisory Committee on Nutrition (SACN), which advises Public Health England and other government agencies on nutrition, wants the recommended daily intake of sugar to be halved to reduce obesity risk and improve dental health. The guidelines, which apply from the age of two, are in line with new World Health Organization proposals. According to health experts, 5% of daily energy intake is the equivalent of 19g or five sugar cubes for children aged four to six, 24g or six sugar cubes for children aged seven to 10, or seven sugar cubes for those aged 11 and over, based on average diets. The main sources of sugar in the diet are sweetened drinks and cereal, confectionery, fruit juice, and sugar added at the table. A single can of fizzy drink contains about nine teaspoons of sugar. The British Dental Association (BDA) has called on the government to take heed of the latest advice. Tooth decay is the biggest cause of hospital admissions among young children. The food industry has said calories in household foods and drinks have been gradually lowered in recent years, including sugar reductions and changes to portion sizes. It is one thing setting out what people should aspire to eat, quite another making it happen. Achieving the expected threshold for added sugar – no more than 5% of calories consumed – will be a challenge for government, industry and the public. Some health campaigners say clearer labelling will be needed so people can see at a glance how many teaspoons of sugar have gone into each portion. Many health campaigners want to see a tax on sugar, with doctors’ leaders joining the call this week. The British Medical Association said a 20% levy on sugary drinks would be a step towards the long-term goal of taxing a wide range of products in the fight against obesity.